In a small bowl, combine orange juice, lime juice, garlic and cumin. Whisk to combine. Place chicken and citrus mixture in a tightly sealed zipper bag. Refrigerate for 2 hours. In a large bowl, combine cantaloupe, serrano pepper and onion. Add salt and pepper to taste. Set aside. Spray a non-stick grill pan with cooking spray. Heat grill pan over medium heat. Remove chicken from plastic bag and discard marinade. Cook chicken breasts on grill pan for 7-10 minutes on each side or until chicken is no longer pink. 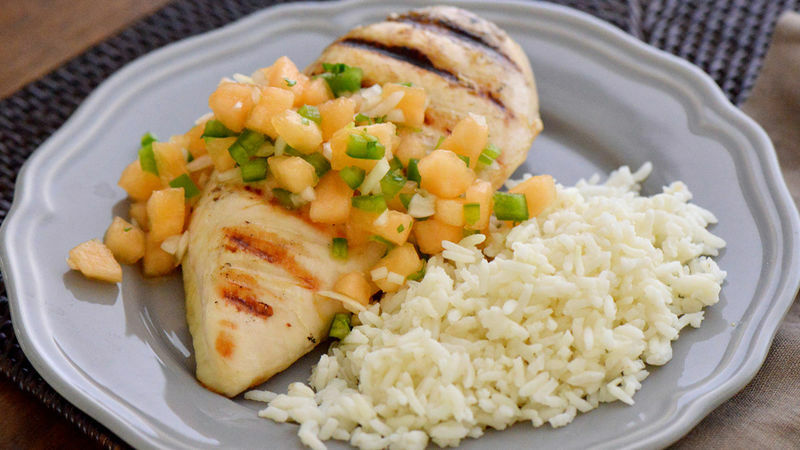 Serve and top with cantaloupe salsa. Enjoy. Omit serrano pepper for a kid-friendly version. Now that school is back in session, evenings are a rush to get everything on our to-do list done. From soccer practices, to homework and bedtime, dinnertime must be quick, easy and full of flavor. Chicken is always a satisfying meal and its flavor can be enhanced with many ingredients. This time, I took one very unexpected ingredient and made it into a salsa: Cantaloupe. With the sweetness of cantaloupe and the spiciness of serrano pepper, this unique meal will please everyone in your family. For a mild version, replace the serrano pepper with bell pepper. The kids will love it!